It is notable that emissions began falling sharply in the 1970s, as a direct result of North Sea gas replacing coal usage. A renewed “dash for gas” in the 1990s also contributed to the fall. 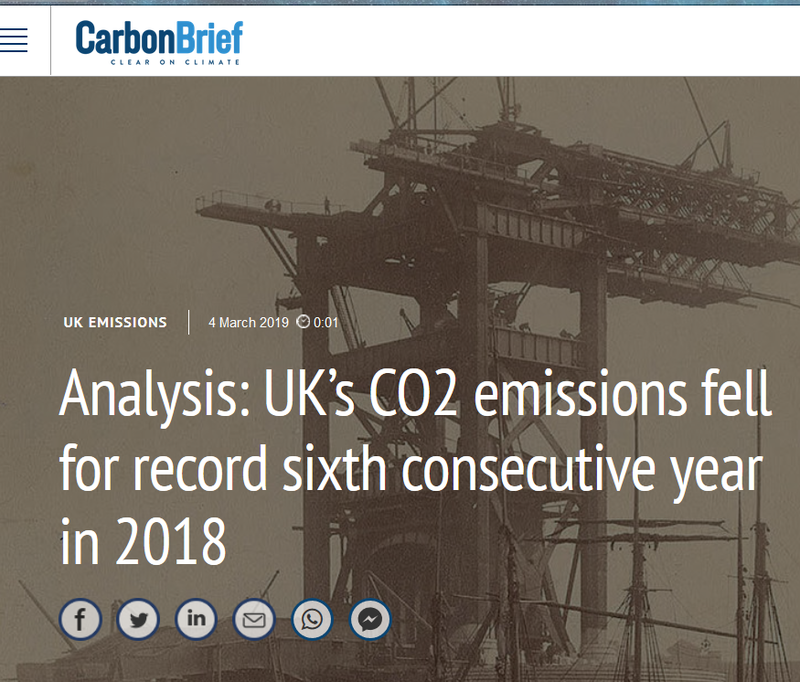 Carbon Brief’s analysis is based only on government data up to Q3, so it is a waste of time trying to prejudge the full year outcome, as they have done. The message is clear – we can keep cutting emissions without harm to the economy, just as we supposedly have in the past. But a look at the actual numbers tells a rather different story. Between 1990 and 2016, emissions of CO2 (ie not all GHGs) fell from 596 to 356 MtCO2. (Latest data is only available up to 2016). Nearly all of the reduction occurred in two sectors, industrial and power. Emissions of CO2 from industry fell by 63 MtCO2 up to 2016. This drop emissions was a steady process, beginning around 2001. It is hard to see that this is anything other than the result of industrial decline. According to BEIS, energy consumption by industrial fell from 34.6 to 23.1 Mtoe during that period. Of course, companies are always looking at ways to save energy, as I can personally attest from my years in the steel industry in the 1970s and 80s. But such savings tended to be more than offset by increased production. Whatever the factors behind this decline, it certainly cannot be claimed by Perry as a positive benefit of her climate policies. The only significant change to the electricity mix prior to 2009 was a major shift from coal power to CCGT. Coal power virtually halved from 234 to 120 TWh, whilst CCGT rose from virtually zero to 159 TWh. Total generation also rose by 40 TWh. Renewables were still in their infancy in 2009, so the vast bulk of the emission savings were the result of the switch from coal to gas, the dash for gas as it was called at the time, which began in earnest in 1993. As in the US with their shale gas revolution, switching from coal to gas resulted in cheaper power and reduced emissions. Again, Perry cannot claim this as the result of climate policy. 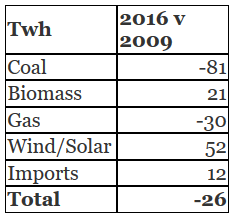 With coal power now down to 21 TWh last year, there is obviously little scope for any more emissions from that direction. Obviously the switch to wind/solar has been a major contributory factor to the reduction in emissions, as has reduced consumption (for whatever reason). 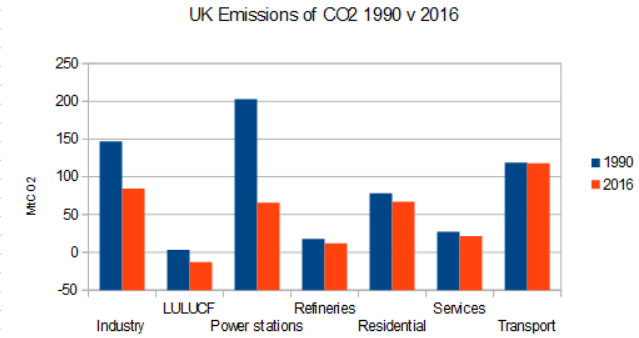 Increased imports has also helped to reduce UK emissions, regardless of how they were generated. Equally, biomass also counts as zero emissions, but we know that this is far from the case in real life. Total emissions have been cut by 240 MtCO2 since 1990, but adding biomass back into the figures as real emissions, the cut is only 226 MtCO2. Of this, arguably only the saving of 42 MtCO2 from wind and solar can be said to be a direct result of govt policy. And this has been achieved only at great cost to the economy. In terms of what is sustainable into the future, even if the power sector was totally decarbonised ( a highly unlikely prospect in the foreseeable future), we would only save a further 66 MtCO2. The reality is that the bulk of emission savings since 1990 have not been the result of renewable energy, nor of any government action. Instead they have arisen because of a mix of unconnected events, which either cannot be repeated or we would not want to see be. To pretend that we can carry on cutting emissions just as we did in the past and without any damage to the economy is mendacious in the extreme. 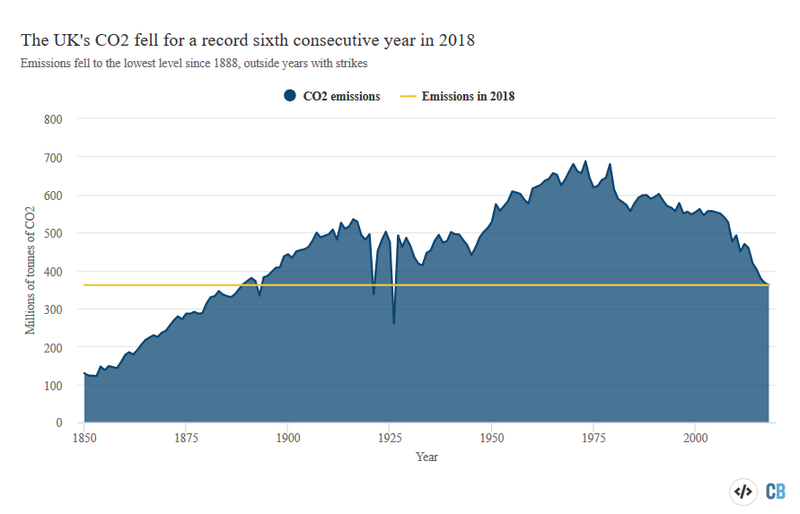 What’s more, if you look at the actual emissions the UK is responsible for, rather than just the emissions from its territory, there’s been hardly any decline in recent decades, according to a recent tweet from Kevin Anderson of the Tyndall Centre for Climate Change Research. In other words, the UK’s apparent success in cutting emissions is mostly a result of the decline of its manufacturing industries. As Carbon Brief point out, most of the recent reduction in emissions have come from reduced coal use. With emissions from coal now standing at just 27 Mt CO2, there is now little scope for more savings. The low hanging fruit has now been picked, and to make further large scale cuts in CO2 will be much more difficult and increasingly costly. One of the fundamental laws of economics is “the law of diminishing returns”. The Stern Review 2006 ignored this when it claimed that the costs of decarbonisation could be kept to 1% of GDP. 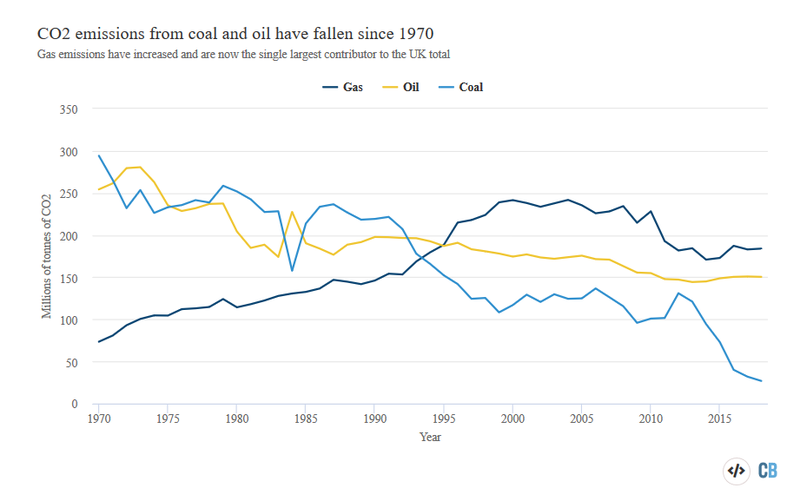 The UK imports a lot more electricity than it used to, but exports some as well e.g. to Ireland. \\ Of this, arguably only the saving of 42 MtCO2 from wind and solar can be said to be a direct result of govt policy. … Hmm where is the accounting for the construction phase of wind/solar ? – In the construction phase the CO2 from conventional power has to increase cos of all the extra energy used to make the concrete & steel for wind turbines & towers and solar power infrastructure..
Now when that GreenPower* does come online then you can turn down the gas and coal , so there is theoretically less CO2 in a year than from keep gas/coal at the old level. but I suspect that in a real world situation and accounting for all factors cradle to grave, you are NOT getting huge CO2 savings. \\ These findings are based on Carbon Brief analysis of newly released energy use figures from the UK’s Department of Business, Energy and Industrial Strategy (BEIS). ie wait 3 weeks and they’ll be better data. There are a few greenhouse gases , and CO2 is second behind water vapour. A planet would still have greenhouse gas warming if its atmosphere had water vapour and zero CO2. The most egregiously dishonest was the one on ‘sinking’ Ghoramara – because the sea levels are rising extra rapidly here because of all the extra melt water coming down the river – they said. The reporter pointed to a supposedly 30ft tree just sticking out the water as an example of how fast this was happening – crazy dishonest stuff. This story of Ghoramara has appeared frequently over the years – even the BBC’s old articles offer alternative explanations for the erosion – bad farming practices, removing all the mangroves etc. At the end of the day any low silty island in a river delta is going to be temporary. The thing not mentioned was that the delta is sinking fast – and the reasons why – partly man’s fault, but certainly not climate change! How can the eustatic, long-run, sea level be changing more in one place than another? You can get different rates owing to river flow, currents, tides, el nino, the fact the earth bulges etc. (Everest isn’t the furthest point on earth from the center) – but the BBC report was just a total confusion of factors dishonestly labelled ‘sea level rise because of AGW’. I just don’t believe these figures. Were we really emitting more CO2 per person in 1880, when we didn’t have cars, aircraft or electricity (in most homes) and no electricity powering TVs, phones, computers etc? When a large proportion of people still worked in agriculture rather than in offices with lighting, computers, air con etc? When we didn’t have large automated factories using large amounts of energy? It is surely not possible? Apparently we used to use an awful lot of coal in the old days! When Drax burns wood instead of coal the CO2 goes down ONLY because of an EU accounting fiction. It actually goes up. This former accountant would give the figure for actual emissions (if known) and divide the destination of it into “permanent addition to stock in the air and water” and “temporary addition to stock in the air and water.” A Note to this would explain that this treatment assumes that EXTRA planting will occur, and the temporary stock will be drained in, say, twenty years. It would also explain that until that draining occurs the temporary stock will play the same role in the dynamic economy of the environment as the permanent stock. This former auditor would also say that the accounts are based on submissions by the Management, do not conform to generally accepted accounting principles, and are NOT certified to be true and fair. UK CO2 production = 1.4% at most of the global total, so a reduction of 1.5% of that = a global reduction of 0.021%, for which we are paying through the nose. It won’t even be noticed. UK CO2 production = 1.4% (at most) of the world’s total. A reduction of 1.5% of that = a global reduction of 0.021%, for which we are paying through the nose on our energy bills. No-one will even notice it. Attempt 1 didn’t appear at first. How do I delete an unintentional duplication? I don’t want UK emissions to fall, I want them way up. Lets go back to coal, please. The graph looks like the movement of industry to China and East Asia. This morning I shovelled all my doggie-doo over the fence into my neighbour’s yard, so my “doo” went way down. Just as much total “doo” as yesterday in the “hood”, but I’m not contributing! Aren’t I virtuous? EDF just notified me of the price cap rise effect – works out at 11.5% on my usage. Might be able to reduce that to merely 10% by switching! Worse to come, I’ve heard the standing charge is to be substantially increased to better reflect actual network (i.e. green) costs. Most ofthe decline was a drop in manufacturing as industries went offshore to China were they primarily use coal so not worldwide emissions went up. The Cinese know this is economic suicide by the Europeans and are happy to play along.